When Gaby first told us that part of her ‘cancer recovery plan’ was to finally do something about her long time concern for the plight of the Rhino, we thought this was maybe another of her grand ideas that stayed just that – an idea!! But what we know after many years of friendship with this woman is that when she follows through with an idea like this, her passion knows no bounds. Our walking with Gaby was an extension of being beside her through the challenges of her cancer treatment. It was a stand to say “we support you in your quest for wellness and for justice”. 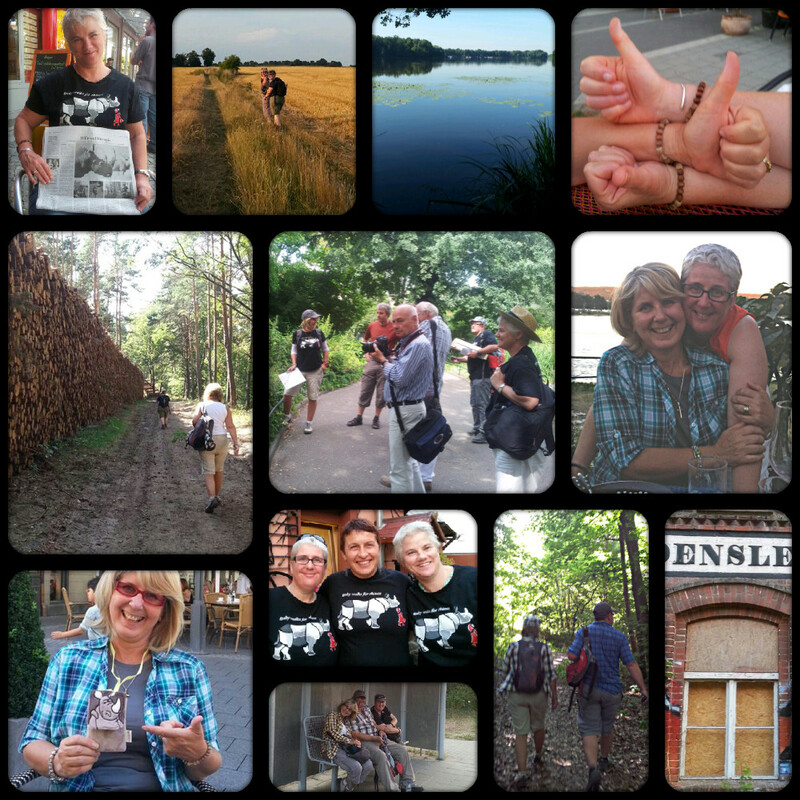 Late July we joined Gaby and John in Berlin. Clad in our collaboratively designed eye fetching t-shirts, the plan was to walk with Gaby for 7 days to help raise awareness for this majestic creature. Prior to departure saw our first encounter with a baby rhino, and its mother, plus the German press both at the Berlin zoo. Whilst this was a rather small gathering of journalists, the impact was fantastic with a huge acknowledgement of Gaby’s efforts in major Berlin press and especially through Animal Planet. This was a great way to start!! It was from here that we ‘three musketeers’ set off towards Hamburg. These days were filled with laughter, blisters, song, newspaper articles, history, paparazzi evasion, tears, pain and much more. Comfortably accommodated at a local golf resort we set off early each day with John, the roadie extraordinaire, dropping us off at a designated spot! 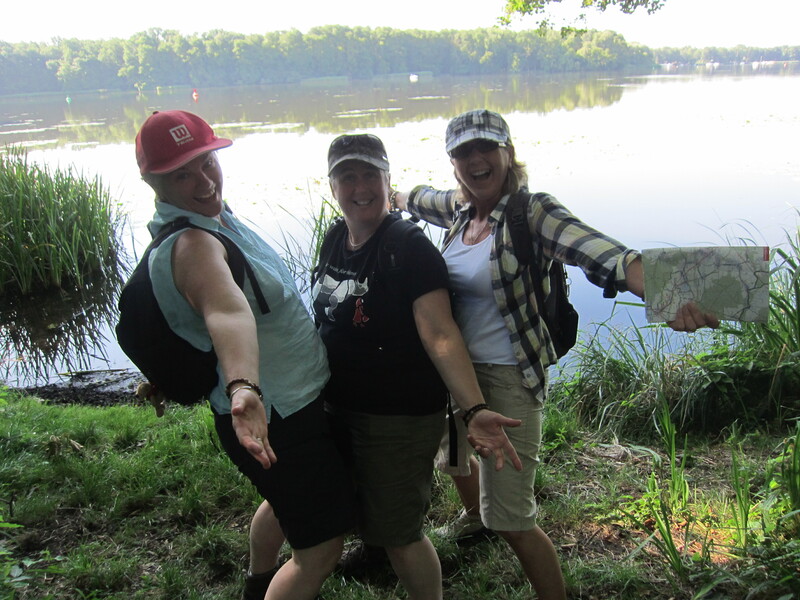 We averaged approximately 15 to 20 kilometres a day walking through forests and villages, by lakes and rivers, along roads, across bridges, through fields and even cemeteries…you name it. Arguably, we were assisted by a sophisticated GPS device which became the source of many laughs during our week. At John’s insistence Gaby religiously adhered to its directions, often to the point of her utter exasperation. Granted we never really got lost due to a combination of common sense, maps, intuition and… yes alright, the GPS. John remained a true believer right to the end…I swear he took it to bed with him at night such was his adulation! One rare occasion when John accompanied us, the GPS reigned supreme…successfully. 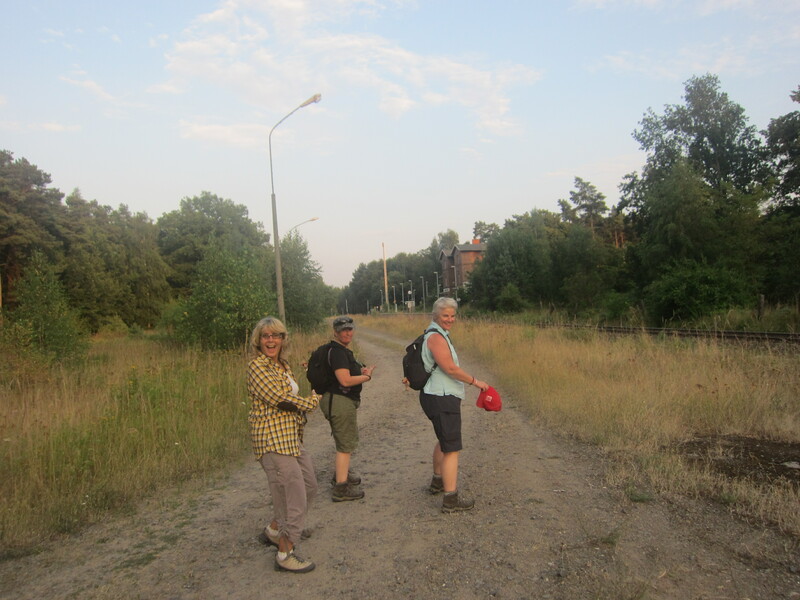 However, it did see us reach a dead end after trekking hours along a lake with mosquitos you could ‘put a saddle on’ and taking a “short cut” through some farmers treasured wheat fields to get to an abandoned railway station where we finally boarded a train back to civilisation! I’m sure I heard a muffled ‘phew’ from John as the train slowed to pick us up!! That day was memorable for many other reasons, another being the sight of our intrepid Gaby not content at idly waiting for the train but rather walked up and down the line to add to the kilometre tally for the day. 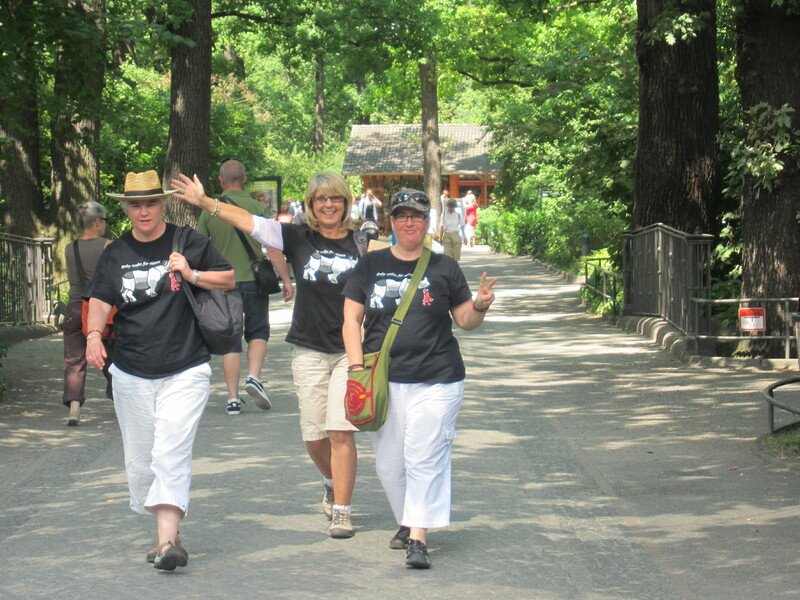 Gaby walks, and walks, and walks for rhinos!! Blisters deserve a mention. We trained in preparation for our bijou journey but nothing of course prepares you for the combined effect of the heat plus asphalt, gravel, dirt paths and cobblestones on the feet. We all endured the blighters with Kate ‘blowing a tyre’ and reluctantly forced to sit out a day to heal. It was a comical sight in the evenings with the three of us, feet up bandaged up after amateur surgery was performed and a well earned beer in hand! 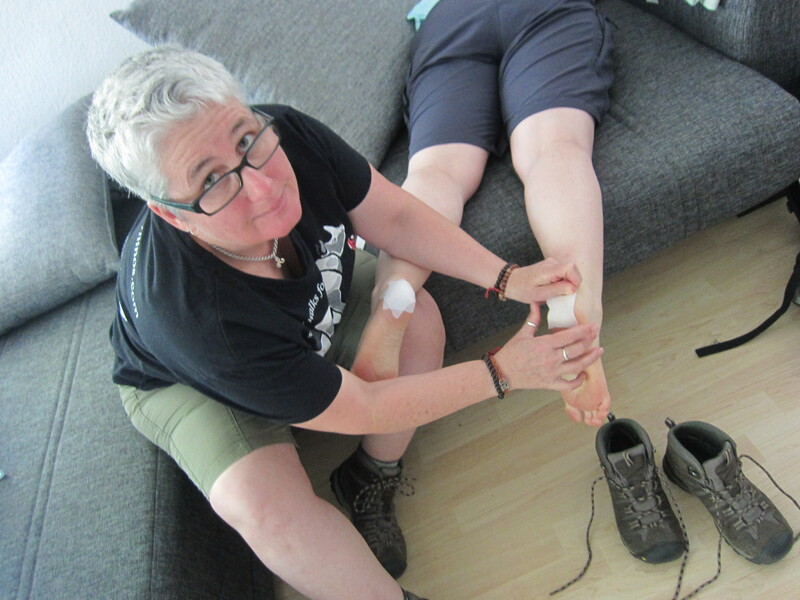 To cite John, Gaby is a “machine” as she’s continued to ‘carry’ her blisters for the majority of the walk as well as endure the neuropathic legacy of the cancer treatment. She is remarkable. …and so is John. They make a great pair. During our week John was roadie, cook, travel agent, IT technician, shopper, manager, media liaison, blogger, campaigner, transporter, drinks waiter at the end of a long day….he made it all possible. Unaware of the nuances of German law in the eastern parts, it was not without a little nervousness that we regularly admired John’s clandestine ways of distributing flyers and cards. It’s a brave man who wanders the streets of some eastern German village’s letterboxing about animal preservation! If Gaby’s a machine, John’s the engine! We had such a good time due to the selfless, silent efforts of that man and the generosity of spirit of both Gaby and John. Awareness is growing, however small, with every step that Gaby, and those that walk with her take. Certainly our experience is that the people we encountered care…it remains to be seen if, as a species, we can galvanise those feelings and act promptly. Terrific blog post and the photos are the best. So far you’ve made it already? You’re almost there, Gaby, keep going! I hope we can meet again sometime when you have completed your journey, before you go back to australia. I would so like to see you and John again, of course!